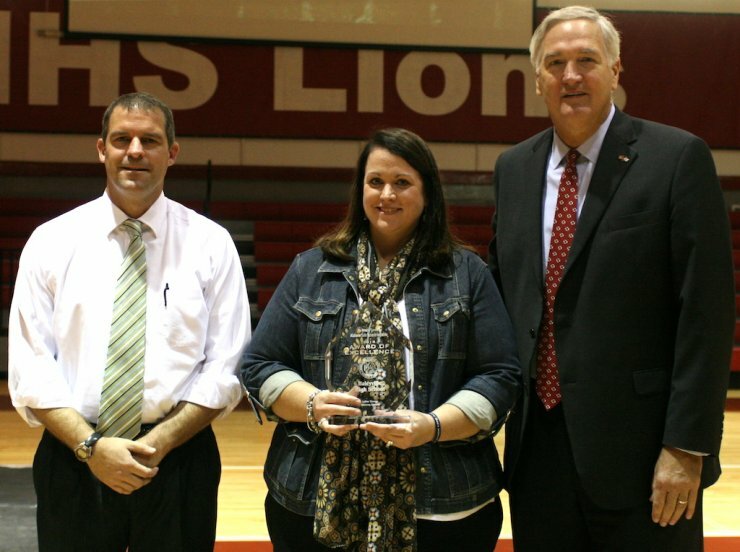 Alabama Attorney General Luther Strange presented Haleyville High School with the Alabama Safe Schools Initiative Award of Excellence Tuesday morning. This award is only given to one school in each district each year, making HHS one of only eight schools to receive the honor for 2014. Haleyville High School Principal Dr. Holly Sutherland stated this award is a portfolio award and required hours of preparation and documentation for submission for consideration. She commended Assistant Principal Al Temple for his time and effort that made the receipt of the award possible for Haleyville High School. She stated this initiative represents the great things that have been done to prepare for an emergency the school might face in the future. During the award presentation, Attorney General Strange commended the students, teachers, and staff of Haleyville High School for being a leader in providing safety and for representing the future of Alabama schools. He stated school safety is critical, as students cannot study and learn unless they feel safe inside the classroom. Attorney General then commended the Haleyville Community as a whole for the cooperation among agencies and stated the relationship exhibited between the school system and the law enforcement community was one of the determining factors in awarding this honor to Haleyville High School. Other items that stood out in the application for Haleyville High School were the color-coded emergency flipbook provided to teachers to better prepare them for dealing with emergency situations in the classroom. Strange also commended the school for being proactive in teaching students how to stay safe while using social media sites and the Internet. He stated this is essential for the future for all students. Because of the outstanding preparation and planning by Haleyville High School, the ideas and practices found in the plans will be incorporated into the state plan that will be sent to schools statewide as recommendations for their own emergency planning.